No Short Corners: The moral of the story: Champions never say die. The moral of the story: Champions never say die. And neither do their fans. It's been a while since I've paid much attention to baseball. Is Ozzy Smith still playing? Did he do backflips when they won? Congrats, Greg. Great comeback by the Cards. I've been wondering where your Cardinal comments have been! Congrats. 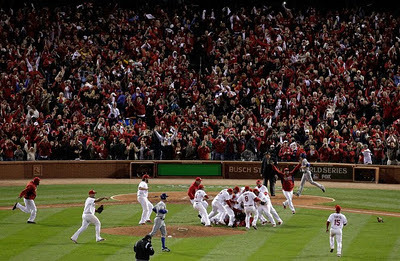 My wife is from St Louis - I thought game six was going to kill her. Terrifically fun series, although I would have gone with Carpenter for MVP. I told my wife when Wednesday was rained out, the Cards would win because it meant Carpenter could pitch game Seven. I said the same thing about the rain, Tony. Thanks, everybody. Now, I get to actually return to the land of the people who sleep at night! So long to Tony. We didn't always see eye-to-eye but I was always a fan. Now I need to send my Christmas wish list to John Mozeliak. At the top, Joe Maddon, plz.